The New York Post frequently refers to this borough as “sleepy Emmaus,” in its reporting of all things Rodale, Inc., which had been headquartered here for decades. But local historians point out that’s just not true. Not to mention, local businesses are flourishing in the town that was founded in 1759 by Moravian settlers. “There are always events and activities in town that give back to the community,” says Jeanne Harakal, president of the Emmaus Historical Society. Emmaus sits on the north side of South Mountain in Lehigh County. The area was originally called Maguntsche by the Native Americans, and was later named Salzburg or Salisbury. But in 1761, settlers changed the name to Emmaus, a town that, according to the New Testament, was seven miles from Jerusalem. In 1938, citizens worked with the local Rotary Club to sign a petition to officially change the spelling back to Emmaus, which is how it’s spelled in the English and German bibles. That said, the road that leads into Emmaus from the east is still called Emaus Ave.
Today, there are some 11,000 residents of Emmaus, and the borough has won various awards, including the Top 100 Places to Live in the United States by CNN Money Magazine in 2007 and 2009. 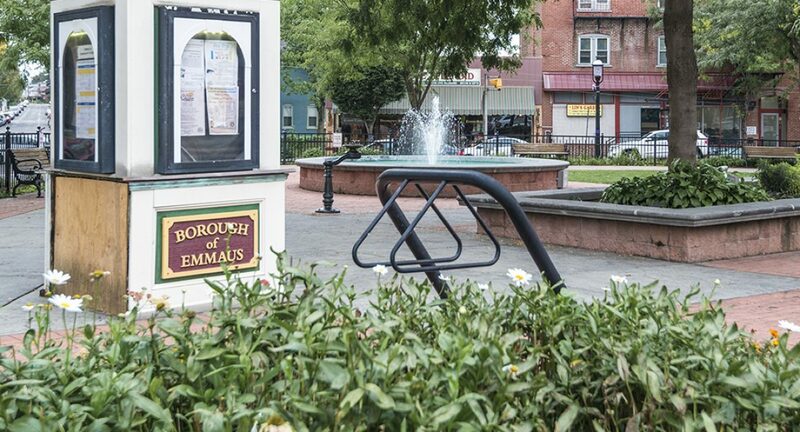 And just this past summer, the Pennsylvania Chapter of the American Planning Association designated the Emmaus Triangle—in the center of town—a Great Public Place, as part of its Great Places in PA Program. Tucked away on Jubilee Street is a tiny pizzeria that prides itself on using local ingredients and authentic Italian pizza-making. The husband-and-wife team, Andrew Foreman and Marguerite Viola, opened Switchback in 2012, after spending two months in Italy learning how to cook wood-oven pizza and make traditional cheeses and pasta. It’s hard to choose just one treat from Baked Café and Bakery (and we’re not saying you have to!). Small batches of cookies, scones, and muffins are made daily onsite. You can also choose from a unique selection of sandwiches, savory tarts, baked oatmeal, and salads, made with organic, and often local, ingredients. You don’t have to be a cycling enthusiast to take advantage of this hip café. But if you are, the team can handle all of your cycling needs. Saddle up to one of the café tables for a coffee—certified organic beans made especially for South Mountain Cycle—and talk shop with one of the bike techs. The market, held Sundays from 10 am – 2 pm, is an effort to provide the Emmaus community with local and nutritious fresh produce, as well as supporting and preserving local farmland. There are more than two dozen vendors that include coffee roasters, baked goods, produce, and meat, all of which are located within 75 miles of the market. A little removed from the bustle of Emmaus’ Main Street, Trapp Door is a quiet, ambient gastropub that features a range of craft microbrews, including drafts, cask ales, and bottles. The food menu changes with the season and uses local ingredients. Drafts and casks are half off Tuesday through Friday, 4 pm – 6 pm. Established in 2014, Funk was the first brewery in Emmaus. The microbrewery is IPA-centric, although it does brew all kinds of beers. Funk has two locations: Emmaus and Elizabethtown, but its can releases draw hundreds of people from all over Pennsylvania, New Jersey, and New York. In November, Funk will brew a limited release South Mountain Coffee Stout, using coffee beans from South Mountain Cycle Café. While Funk Brewing is a microbrewery, Emmaus’ newest watering hole is a nanobrewery. Which basically means it makes even less beer and is often run by just one person. Owner and brewer Jim Yergey is a retired chemist whose “Hoptileitious” won the 2014 “Be a Brewer for a Day” competition—that’s the beer that started it all. If you’re in the mood to flaunt your more sophisticated side, try Triple Sun Spirits, an artisanal distillery, which features various rums, whiskey, and gin for sale by the bottle and in craft cocktails. Try: The Cuba Libre, a refreshing combo of cola, rum, and lime juice on ice. Since 1920, moviegoers have frequented the small theater near the Emmaus Triangle. Its old-fashioned marquee changes weekly to announce new releases and BYOB special screenings like Rocky Horror Picture Show. For a unique occasion, you can rent the theater to socialize and screen a movie. Sure, Let’s Play Books sells children’s titles, but it specializes in programming, including author events and community activities. One favorite is a real-life “Where’s Waldo?” in which participants search for the character in local Emmaus businesses. Let’s Play Books also offers adult events, including book club chats. No experience is necessary for these classes, which include pet portraits, canvas painting, and string art. You can unwind with a date night, or treat your kids to a night out. Paint on Main also offers private events, perfect for birthday parties or bachelorette parties. This cute shop sells natural bath and beauty products—lip balms, scrubs, nourishing creams, and soaps—made with ingredients like goat’s milk, beeswax, and essential oils. Owner Khine Alkhal and a team of local moms make everything locally. Join them every second and fourth Saturday from 10 am – 11 am for free “Meet N Keep” workshops, where you can learn about the products, get free samples, and make new friends. We get it, a furniture store doesn’t seem like an attraction—but this one takes the stress out of big purchases. Family owned and operated since 1960, Royal Furniture provides unmatched customer service, big name brands, and will special order products to meet your individual needs.